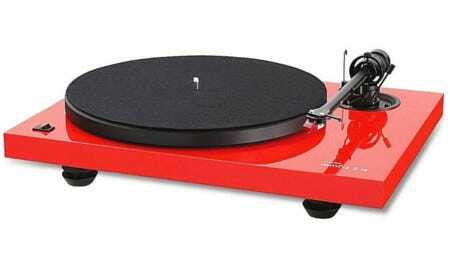 A belt-driven audiophile turntable with style, at a great price. Music Hall MMF 2.2 Turntable. The MMF 2.2 is a belt-driven turntable at an amazing price. The construction of the MMF 2.2 has been simplified to focus more on the critical music making components; the main bearing, the motor, and the tonearm. The MMF 2.2 is constructed using high quality components and comes complete with the Music Hall Magic 2 moving magnet cartridge pre-fitted. Setup is simple and easy with the cartridge being pre-fitted and aligned in the factory so you will be ready to start listening to your favourite records in no time. The MMF 2.2 supports both 33.3 rpm and 45 rpm records. Sticking with Music Hall's simplified focus and minimal design approach, speed change is handled manually by the listener. Simply remove the platter and move the belt to the appropriate notch on the spindle. This process eliminates the need for an extra gearing system or other electronics which can add noise to the signal, keeping the listening experience as clean as possible. The MMF 2.2 features a special anti-skate system using gravity to keep the tonearm aligned correctly. A small weight is used to counter-act the inherent force that pushes the tonearm towards the centre of the record due to the friction between the stylus and the records surface. This ensures the stylus is balanced perfectly in the records groove. A removable hinged dust cover is included to protect your new turntable from dust and also to help isolate it from unwanted vibrations from your speakers. All Music Hall turntables include a 3 Year Australian warranty.